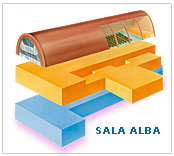 Sala Alba is divided into 38 stands, dimensions of 3 metres by 2 metres. Welcome Desk where you can carry out all the operations of credit advice at the start of congress and as an information point or for a secretary during the works. A large adjoining room can be used for working lunches, coffee breaks, cocktails and gala dinners. On this floor there is the first bar. 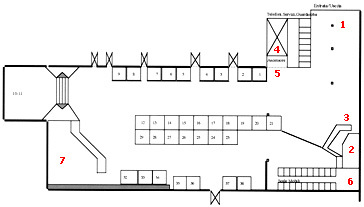 Present of: 5 electricity sockets every 6 metres (1.5 kw), water, telephone, token ring socket for computer, closed circuit TV, goods lift, production room for connections and projections, Welcome Desk and organised secretary room, bar. La Sala Alba of the Congress Building Montecatini Terme is equipped with the most sophisticated technical equipment such as televideo-conference. As well, one can be connected in real time with every type of data bank. Receive via satellite every distributed programme. It has a computer system put to point from two prestigious Italian universities and supplied use of amplification, registration and projection systems, in line with the most advanced particulars.